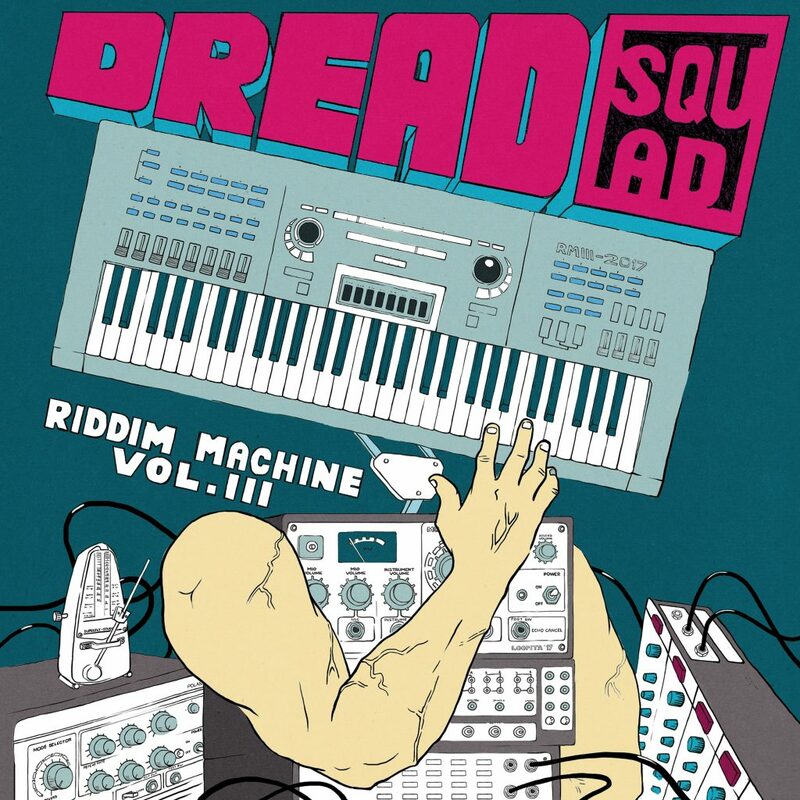 Dreadsquad, AKA Marek Bogdanski, returns to the scene with the second and third instalments of his Riddim Machine series. As part of a collaboration consisting of Dreadsquad’s own Superfly Studio and the renowned Moonshine Recordings, listeners are in for a treat, courtesy of Poland’s most prolific reggae dancehall producer. As ever, Dreadsquad manage to encapsulate all evolutions of reggae – from rocksteady , roots and rub-a-dub to dancehall and dub – all with a present-day twist to keep the bass bins rumbling and the people skanking. Both volumes will be available in both vinyl and digital format, so there’s no excuse to miss out! Volume 2 is laced with an amalgamation of characters from the Reggae/Hiphop/Soul scene, featuring the likes of Kojo Neatness , Gardna, El Fata, Dub Princess, Tenor Youthman, Takeyce-Ti, MonkeyJhayam, ManeceLive or Greg Blackman in his soulful roots tune Clean Up. Among a plethora of sublime productions, with throwbacks to the old sounds of early reggae, roots and rub-a-dub, there’s the highly anticipated anthem Issues (previously released on Bun Dem Riddim), with none other than the mighty YT on microphone duties . Keep an ear out for the remix of Chainska Brassika’s Knowledge Is King (featuring Tom Spirals); there’s some serious stepping to be done to this riddim. The closing track for this volume is more than worthy of a mention, as Space manages to deliver a transcendentally meditative dub vibe to bring the record to a close in a suitable fashion. 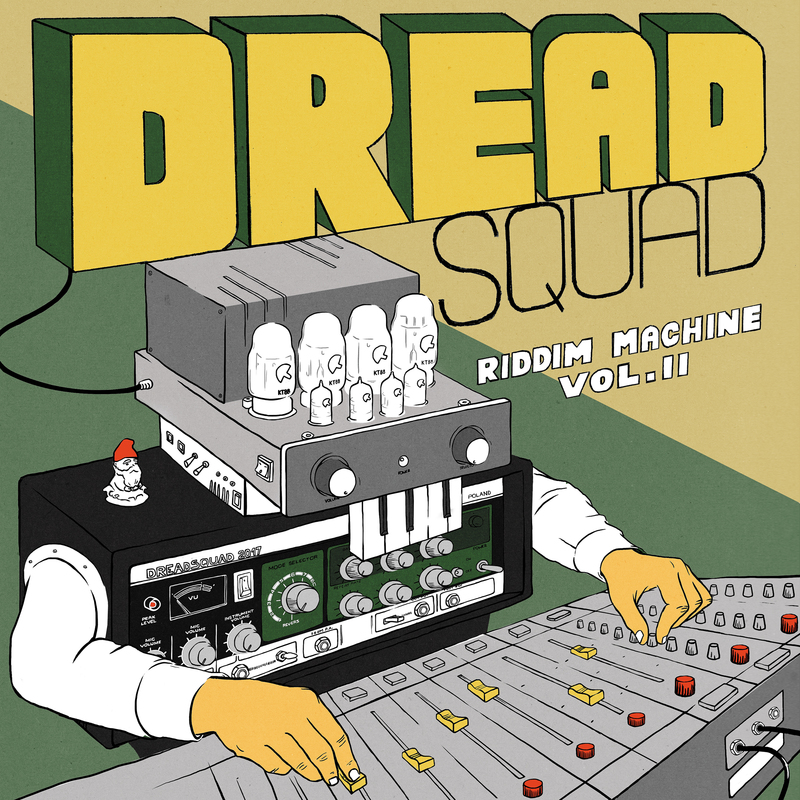 Volume 3 serves to retain Dreadsquad’s core values – their attitude towards mash-ups and remixes, their roots in all that is reggae – whilst also providing a sound that is refreshing, original, and showcases some of the finest up & coming talent. Whereas Volume 2 remains much more true to its roots, Volume 3 turns up the heat and brings the heat to the dance. Once again, the LP is littered with artists who are soon to be on everyone’s radar. Skarra Mucci, Zico MC, Jman, Charlie P, Million Stylez, need we say more? Riddim Machine Vol. 3 is chocked full of edits and remixes guaranteed to start a fire in any venue. The legendary Papa Michigan’s Nice Up The Dance is flipped on its head, with just the right amount of amen breaks and Reese bass to keep any junglist’s gun fingers in the air. Get Away revolves around a display of lyrical wizardry from MenaceLive, Jman and Zico MC in true cypher style. Charlie P makes a special appearance for the digi-dancehall smasher That Is Life, complete with classic 80s orchestral hits reminiscent of the foundation fashion. This one’s a dubplate; you should feel blessed to hear it! Both volume of Riddim Machine feature artwork illustrated by Kasia Wilk. The releases will be available digitally, via most online download stores (iTunes, Juno, Bandcamp, Amazon, etc. ), as well as a physical vinyl release, available at most usual vendors. The Riddim Machine Vol. 2 by Dreadsquad & V.A. The Riddim Machine Vol. 3 by Dreadsquad & V.A.